The 50th Super Bowl will be played next month, and all season long, the NFL has marked this pleasingly round number with tributes to Super Bowls past. Nobody is more committed to nostalgia than Kansas City Chiefs head coach Andy Reid, who demonstrated his appreciation for the history of the game last Saturday. Midway through the fourth quarter of his team’s divisional round playoff game against the New England Patriots, Reid’s Chiefs trailed by 14 points and thus needed two scores to stay alive. 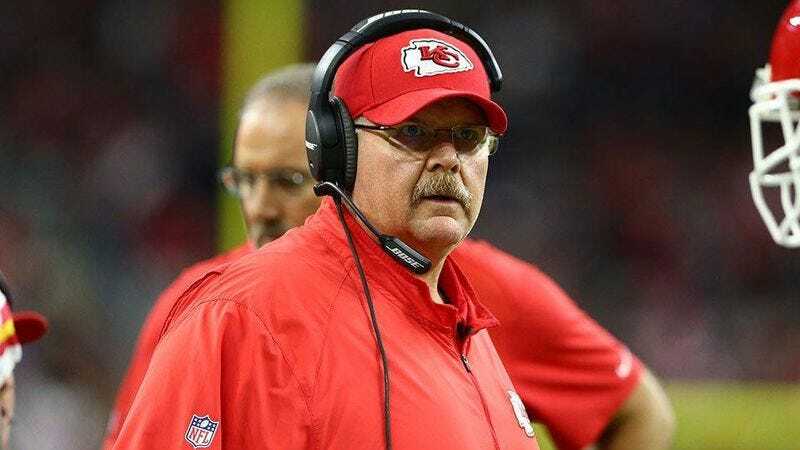 Most coaches in this situation would make their players adopt a faster tempo to preserve as much time as possible, a strategy known as “attempting to win the football game.” But the Chiefs played it slow because the pedestrian concerns of victory and defeat are irrelevant to Andy Reid. He is a storyteller first, a football coach second. Reporter: Andy, can you explain your clock management toward the end? Reid: Yeah, well—towards the end, or in the first part of it? Reporter: Right before the—toward the end of the fourth quarter. Reid: Mm-hmm. Yeah, we wanted to get a play off right there. We had 20 seconds. It was 2:20 on the clock. Wanted to make sure we got our best personnel in for that play, and we didn’t get that done. Yeah, well—towards the end, or in the first part of it? Here Reid appears to suggest that his interlocutor might want to discuss the Chiefs’ clock management in the early parts of the game. And that raises a fair point: Why do we always criticize the old ball coach’s late-game decision making? Ask any student of football, and they will tell you that Reid’s first-quarter clock management is beyond reproach. Reid was hopeful, sweetly so, that he might be commended for deftly shepherding his squad through those initial 15 minutes. Alas, the jackals in the press only wanted to talk about the fourth quarter, as if there is something special about that quarter in particular. Hogwash. The four quarters of the game are all Reid’s children, and he loves them equally. Except the fourth quarter, which he hates. Yeah, so, we went hurry-up offense. The notion that the Chiefs went into their “hurry-up offense” is seemingly belied by the fact that they did not hurry up—and, for that matter, appeared to slow down to the point that their advance down the field could only be detected by sensitive scientific instruments. But that quibble depends on such a literal interpretation of “hurry-up offense.” After all, Reid practices an offensive style that’s known as a “West Coast offense” even though the principles of the “West Coast” approach were largely developed by teams playing in Ohio. Perhaps Reid believes that “hurry-up offense” is, by the same token, a mere name that does not correspond to reality. That would explain why his implementation of the hurry-up includes cigarette breaks. You do that normally when you’re down by two scores. That’s a little pointer on football strategy for you, America, which Reid provided free of charge. Yet nobody thanked Andy on Twitter after the game—some people even said mean things! A nation of ingrates. And this is the key point. When Reid considers the final minutes of the Chiefs’ 2015 campaign, he does not see failure. He views football through a different lens than the rest of our victory-obsessed culture. Downright chipper as he addressed the media on Saturday, Reid was content with Kansas City’s “loss” because he told a good story—a tale of proud warriors who maintained their stoic composure as they marched, slowly, toward their certain demise. While his strategy may have stifled his team’s chance to win, it also heightened, in Shakespearean fashion, the drama’s sense of cruel fate. You can guess which one is more important to Reid. 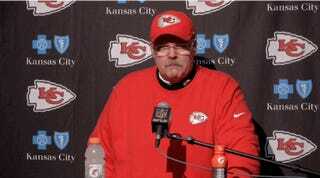 So of course the Chiefs coach is baffled when the press asks him about “clock management.” He manages the narrative, not the clock. As a tactician, he infuriates his teams’ fans. But as a tragedian, he is without peer. We all knew that somehow, the AFC would come down to these two men. It’s the clash of big personalities that makes the media swoon. The pregame shows will talk about it. The postgame shows will talk about it. Jim Nantz and Phil Simms will bring it up as soon as their broadcast begins, and can you blame them? After all, casual fans and diehards alike will tune in on Sunday to witness the latest, possibly last chapter in the storied rivalry between New England long snapper Joe Cardona and Denver’s Aaron Brewer, a person who is also a long snapper. Both athletes are recognized as masters of their craft, even if they approach it differently. Cardona concentrates obsessively on the length of his snaps, whereas Brewer’s focus has always been on longness. But there are more similarities between the two players than they might like to admit. Just look at the statistics: Brewer averaged 8.0 yards per snap on field goal attempts this season, and Cardona averaged exactly this much as well. With numbers like that, it’s no wonder that New England and Denver are once again the class of their conference. Finally finding time to see Star Wars! Amid the Brewer-Cardona furor, it can be easy to forget that there are 52 other guys on each of their respective squads. And sure, football is a team sport. Everyone knows, though, that come Sunday, the country will collectively gaze between the legs of these legendary competitors as each man bends over to vigorously shove a ball through his crotch void. Whose legacy of ball-shoving will be burnished in this year’s AFC Championship game? Either way, history will be made, in a snap. The Block & Tackle prediction: New England 40, Denver 13. I was foolish enough to surmise that Block & Tackle’s recent chronicle of coin-toss mishaps was an exhaustive accounting of everything that could go wrong with the act of ceremoniously throwing a coin on the ground. But referee Clete Blakeman added to the NFL’s numismatic lore as Saturday’s Packers-Cardinals game went to overtime. When Blakeman first threw the coin, it sort of hovered in midair before flopping to the ground. So it flopped, but crucially, it did not flip—somehow spending the whole toss in its original heads-up position. This non-turn of events alarmed Packers quarterback Aaron Rodgers, who had called “tails” and immediately protested that the toss was illegitimate: “It didn’t flip!” he cried. (Rodgers had thrown an astonishing Hail Mary to force overtime—remarkably, his second last-gasp miracle pass of the NFL year—and he did not intend to have his efforts thwarted by a rotationally stable disc.) Blakeman, to his credit, had the wherewithal to recognize that Rodgers was right, and he picked up the coin for an exceedingly rare re-flip as the Arizona captains looked around in confusion and mounting anger. The second toss also landed heads, making it the greatest moment of Clete Blakeman’s life. After overtime came to a swift conclusion with a Cardinals touchdown, Rodgers complained that he didn’t get the opportunity to change his mind about that squirrelly coin. Blakeman “picked the coin up,” Rodgers recounted, “flipped it to tails, and then he flipped it without giving me a chance to make a re-call there.” Rodgers has said some smart things at the presser podium this season, but this is not one of them. Because a coin flip is random—at least, when Clete Blakeman doesn’t screw it up—the heads-or-tails call is meaningless. It’s an empty courtesy extended to the visiting team to make them feel as if they have some control over their fate. And that randomness is an important aspect of the NFL’s overtime rules, which do not, contrary to the protestations of Green Bay fans this week, require an overhaul. A football game is four quarters long. Overtime is an unnatural state of affairs, and accordingly, the rules abhor it, seeking to end the excess period at the earliest possible opportunity. The college overtime rules—endorsed this week by the Packers’ Clay Matthews—are a perversion, guaranteeing teams an equal number of chances to possess the ball even though this guarantee does not exist in any other context of the game. Plus, extending NFL overtimes would keep players on the field when they are most fatigued and thus especially susceptible to injury. The league’s current setup may seem unfair, but hey, Green Bay got to put 11 guys on the field just like Arizona, and that’s fair enough. More to the point, the randomness involved in overtime is a crucial element of game design, serving as an appropriate (albeit generally unheeded) disincentive against playing for a tie. If the Packers wanted to minimize the role of caprice in determining their destiny, then they should have gone for the two-point conversion after scoring that touchdown at the end of regulation. When they instead went for the more reliable extra point, they implicitly submitted themselves to the fickle whims of the coin. If you choose not to seek victory, don’t be so hurt when victory doesn’t seek you. Block & Tackle’s previews of last week’s playoff games featured a couple of head-to-head comparisons of quarterback press conference apparel, yet these fashion faceoffs did not include Cam Newton, the league’s current and indisputable champion of podium style. So here now is every Cam Newton postgame look from the 2015 season, reviewed. Week 1. The unapologetically plaid jacket was a bold way to start the year, and the mini-plaid pattern on the faux boutonniere adds a flourish of fun to an outfit that isn’t exactly lacking in whimsy to begin with. But the sunglasses hanging off the black T-shirt constitute a rare misstep for Newton, pushing the look dangerously close to lounge lizard territory. Grade: B-. Week 2. Perhaps in reaction to the skeevy styling of his debut look, Cam tacked toward a tight preppy feel the following week. Neatly clad in variations on Carolina blue—nobody can accuse him of failing to show team spirit—Newton cuts an all-American profile. The textured jacket adds an appealing touch of modernity that keeps this look from feeling too routine. Grade: B+. Week 3. The look of the year. The camouflage is the attention-grabber, but the key to this outfit is the checked shirt under the jacket. Its orderly pattern contrasts with the blobs of the camo, and more importantly, the neutral blend of colors tempers the look just enough so that it can exude sophistication despite itself. (The tidy bowtie gives the shirt the room it needs to have this complementary effect.) A standard white shirt would have made the camo pop too harshly, and a blue shirt would have washed out the jacket’s colors. Boys, take note: This is how you mix patterns. Grade: A. Week 4. Cam looked great here because Cam would look great wearing a Hefty bag. That said, this outfit, which incorporates pink as a tribute with the league’s “Crucial Catch” breast awareness program, is more appropriate for an Easter egg hunt than an October football game. Grade: C+. Week 6. This, on the other hand, is the quintessential fall football outfit. The Panthers should adopt this as their uniform. Grade: A. Week 7. Throughout the season, Newton proved his ability to bounce back from adversity on the field. Here he demonstrates that same resilience by returning to the pink theme and doing it right. That stripe of pink on the necktie dances through the stark lines of the suit—accentuated by the razor edge of the pocket square—and renders the Carolina quarterback as a compassionate badass. The boutonniere has become Newton’s trademark, but it feels out of place in this look. Grade: A-. Week 8. This is essentially a gentle variation on the Week 7 outfit; Cam just wanted to show us that he can pull off beige, too. Grade: B+. Week 9. A hastily ironed bright white shirt diminishes an otherwise promising look. And here’s another questionable boutonniere. Grade: C.
Week 10. It’s nice and all, but green might not be Cam’s color. It’s not as striking on him as all those wonderful blues. Also, there’s something about this outfit—maybe the cut of the jacket or the way the collar falls on his neck—that makes the fifth-year NFL veteran look too young, too collegiate. These are minor complaints, however. Grade: B-. Week 11. It’s one thing to have a signature style; it’s another thing to fall into a rut. Newton wisely avoids the latter with this casual yet classy ensemble. I wouldn’t mind seeing some different options for the scarf, but without it the outfit would be a bit drab. Grade: B+. Week 12. The boutonniere finally earns its keep, bringing out the pewter of Cam’s sweater and playing nicely with the reds of his necktie and pocket square. See, earth tones can look dynamic! Especially when they are wrapped around the musculature of a hunky world-class athlete. Grade: A-. Week 13. The paisley-inspired details in the jacket print serve as this outfit’s one puckish nod to classic menswear convention. The high gloss and sleek lines allow Cam to own the press room—or any room, for that matter. Grade: A-. Week 14. That shirt…was it laundry day? Grade: D.
Week 15. As winter takes hold, Cam adds a debonair layer to his reliable blues in the form of an exquisitely tailored overcoat. The necktie suggests a snow flurry, infusing the frigid tones with a small burst of life. Grade: A. Week 16. The medium gray jacket works beautifully with Newton’s skin tone. He should consider incorporating this shade more often. The clashing patterns of the tie and the pocket square create a restrained but welcome energy. Grade: A-. Week 17. This, too, is how you mix patterns. Grade: A-. Divisional round. The overcoat is who cares, and the tie is doesn’t matter. Grade: A. The Block & Tackle prediction: Carolina 30, Arizona 21.